The network is key to gaining an advantage from a digital transformation initiative – from collecting IoT data, through ensuring mission-critical application performance remains optimized in the cloud, to ensuring the appropriate levels of access and security to workers, guests, and machines. The network needs to be far more agile in order to provide your business with better outcomes. With this in mind, your organization deserves an expert networking partner, not a standard provider. At Extreme Networks, we’re focused on you and maximizing your network’s long-term value – we’re not the ordinary networking provider. That’s why we engaged ESG to conduct a detailed Economic Value Validation (EVV), plus develop a quantitative model to investigate how an investment in Extreme Networks can benefit a business over a three-year period. We want to give you a comprehensive picture of the potential direct and indirect cost and benefit drivers you should keep in mind when considering an investment in Extreme Networks. Learn more below or read the full analyst report here! What Can Extreme Really Bring to Your Business? It’s simple – our networking solutions come at a lower upfront cost to your business. Extreme can offer a 10% lower price tag on our offering compared to other vendors. We understand that growing companies don’t have unlimited sums of money to flex as needed, so we are happy to pay it forward with a lower price tag. We assume you’d rather invest the savings into the numerous facets of your business that will have new opportunities thanks to your new personalized networking solution. Extreme Networks convinced us that for a reasonable price you can get a technologically advanced and reliable solution that can be managed through a unified management console. Reality seems to follow Murphy’s Law – whatever can go wrong, will go wrong. It also seems that when things inevitably go wrong, it’s always at the worst possible time! Extreme prepares for life’s unfortunate truths by offering some of the highest quality support in the industry. 94% of our support calls are resolved by the same network specialist that answered the call. While your competitors are waiting in a queue so they can re-explain their IT nightmare to a new specialist, you’ll consistently have a dedicated specialist on the case. It’s well known that the upfront cost of a network solution isn’t the only cost associated with acquiring a network solution. Luckily, Extreme can dramatically cut your expenses across the lifecycle of your solution. For example, a company with 6,600 employees would spend $10.2 million over 3 years with a typical networking vendor. Conversely, that same company would only spend $6.8 million with Extreme Networks – saving them over 33%! 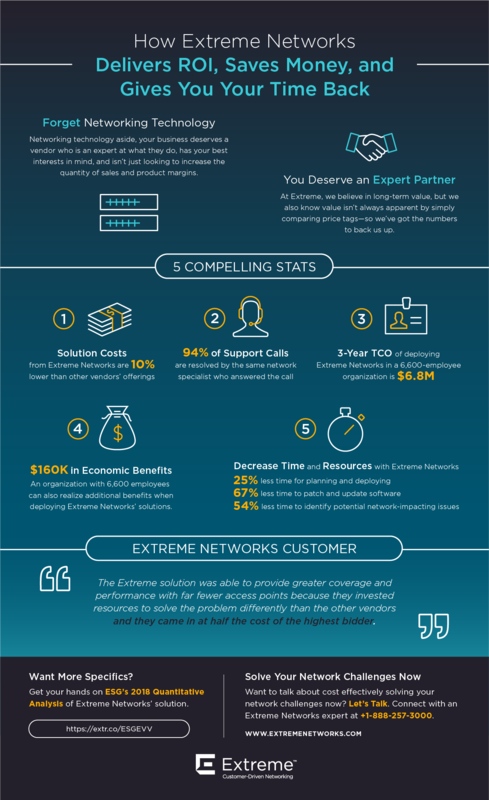 When deploying an Extreme Networks solution, expect to get a little bit of money back. For a business with 6,600 employees, that’s to the tune of $160k. This is primarily due to time saved from tedious network management. Your organization will benefit from a swift support experience, a far easier time identifying network issues, and less time performing updates – all of which burn away valuable labor hours from IT professionals who could better invest their time elsewhere. When these small problems are simple to solve, it leaves more time for your IT team to properly safeguard against tomorrow’s networking threats. Want more detail on just how much savings Extreme can bring? Read the full report: Quantifying the Value of the New Extreme Networks Solution. Thinking about how partnering with Extreme could benefit your business? Click here to contact a sales representative who can specially tailor a custom networking solution to meet the specific needs of your organization.